This wire coil wrapping machine is designed for wrapping medium coil, the package will prevent dust, air and water..so on. The machine, which wraps coils through eye core, is flexible and can be tailored to meet the specification of each customer and packaging line configuration. Wire coil wrapping machine can apply coil information to produce handling choices in the coil packaging line control system. Wire coil wrapping machine utilizes PLC&HMI for operating by touch screen interface for modifying, viewing and entering coil details. The touch screen that allows operator to evaluate coil information for every figure verified. 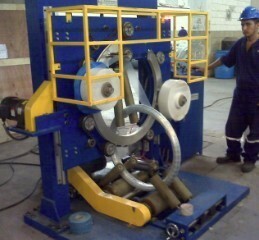 Wire coil wrapping machine offer easy adjustment. In complicated packaging procedure, error occasionally appear. Highly intelligent control system with excellent sensors allow the operator alter all the information just on the interface. We also provide extra options to offer our customers the best machine they have ever imagined. FPW-300 wire coil wrapping machine is an equipment designed mainly used to packaging solution of steel wire coil, copper coil... It is an highly efficiency equipment for coil shape package and is a nice packaging solution for saving labor, product protect and material cost.